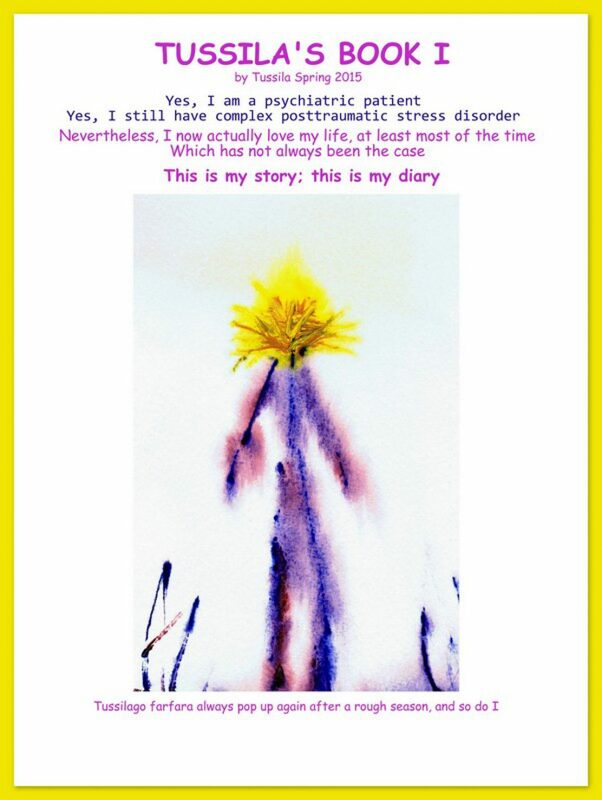 Do you want to know more about living with complex PTSD/DISSOCIATION DISORDER? “TUSSILA’S B00K I” is out! It took me nearly fifteen years to accomplish this dream, but now finally my diary from psychiatric emergency care is published! I very much hope that this book can help to better understand various aftereffects due to childhood traumas! So far, the responses I have received have been overwhelmingly positive. Many people have already thanked me for sharing my story. I hope you too will take this opportunity and I am very excited to hear your opinion on my book, please feel free to comment when you have read it! “The emotions are so strong in this book that the first time I read it I was crying along with her, laughing with her, angry with her. The strength to go on is inspirational itself. If you have ever wanted to know what it is like to live with PTSD this is the perfect book. The paintings are straightforward and inspirational as well. Health care professionals should definitely read this. I cannot imagine the pain she must have gone through to come out strong enough to share her story. It must have taken an immeasurable amount of courage to post her personal diary. Everyone has a different story, Tussila has chosen to share her story with the world. Her desperation, and the road to recovery. Please share with your friends and colleges! Have a wonderful week dear folks! No matter how old I get, my feelings never grow old.